Nowadays, everyone seems to be watching their favorite TV shows and movies through streaming services like Netflix and Hulu. As our recent post explained, cord cutting is on the rise within the Betabound community. Although cable companies have been struggling to hold on to subscribers in recent years, the majority of Betabounders still have cable subscriptions. At the same time, almost all of our community subscribes to streaming services like Netflix and Hulu as well. We recently surveyed over 2,500 Betabounders about their TV watching habits and found a staggering 91% subscribe to streaming services! 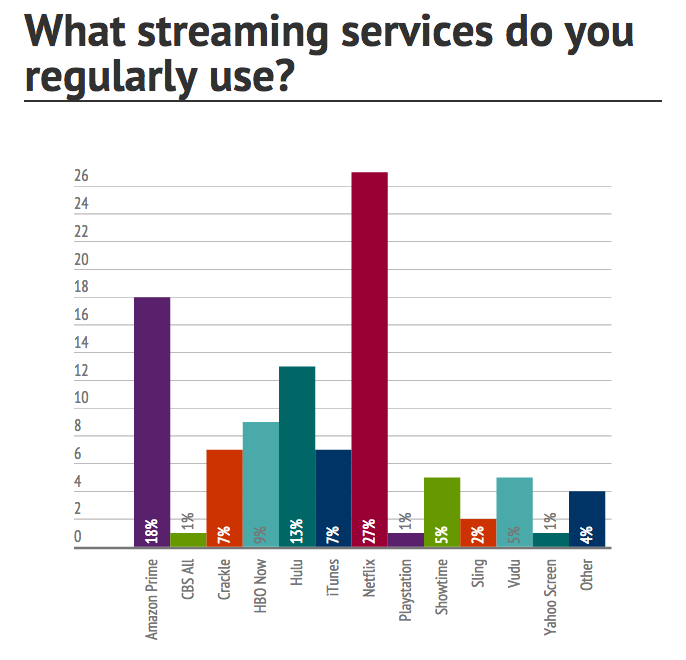 Which Streaming Services Are Most Popular? To our surprise, Betabounders subscribe to over 60 different online streaming services! The two most popular were Netflix and Amazon, accounting for 45% of total subscriptions within our community, with Hulu taking third place at 13%. With the sheer volume of free and paid streaming services available, it’s not uncommon for Betabounders to subscribe to multiple streaming services at the same time. The rise of streaming services has also led to an increase in devices that allow customers to watch streamed content on their televisions, freeing them up from computers and tablets and bringing streaming into the family living room. 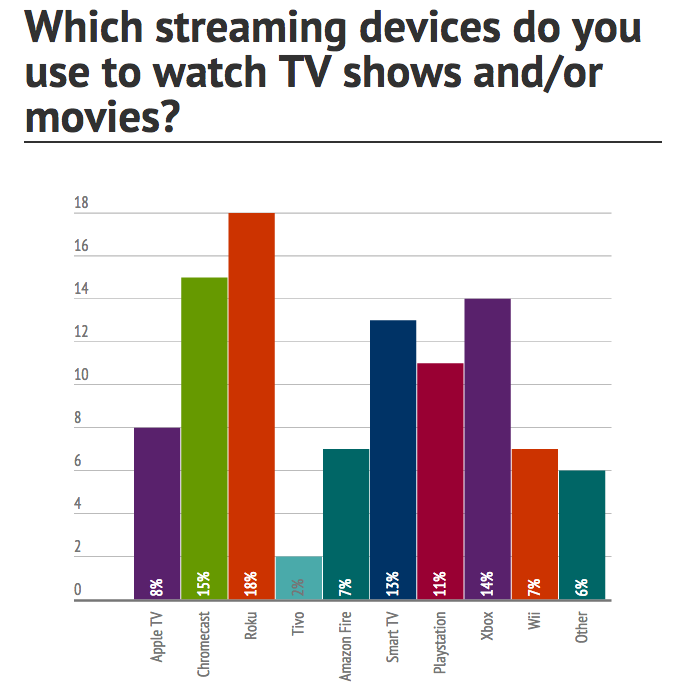 When judging which streaming device is most popular with Betabounders, the results are noticeably diverse. No one company has more than 18% of the market. With no clear winner, and multiple frontrunners, it’s fair to say that the streaming device war has a ways to go before a winner can be declared. The trend toward streaming isn’t just encouraging people to cut their cords, it’s also changing the habits of would-be moviegoers. As more new film titles become available on streaming soon after their theatrical release, many Betabounders are choosing to skip the box office altogether, opting to wait until the film is available on their favorite streaming service. In fact, 40% of Betabounders regularly wait for new movies to come out on services like HBO, iTunes, or Netflix. That’s almost twice as many as the 26% who said they were still interested in seeing upcoming films in theaters. It’s hard to tell how the battle between cable television and online streaming will end. While it is true that streaming is growing in popularity, some of the largest and most influential companies in the media industry are cable providers. Continued innovation will mean more adjustments in both the film and television industries. As these changes happen, you can be sure we will be asking for your opinions, in both our beta tests and our community surveys. We would also like to say thank you to everyone who participated in our cord cutter survey. Surveys are a great tool for us to gain insight into the lives and interests of our community members. They also help us identify community interests, which in turn, helps us run better beta tests for those products. We hope you’ll take part in future community surveys to help us shape and improve Betabound for everyone! If you’re not a member of Betabound (but would like to be) click here!